Anthony Bourdain just launched a new cookbook, is currently on a live tour across the country, and is continuing work on his highly anticipated international market in NYC all while hosting his CNN show, Parts Unknown. And yet, the globetrotting food personality and diehard Road House fan has another big project in the works: a new documentary that takes on the global food waste epidemic. Bourdain will star in the new film, WASTED! The Story of Food Waste, which will be produced through a partnership between his production company, Zero Point Zero Production, and the The Rockefeller Foundation, according to a report by Variety. As the title suggests, the documentary will use cooking, science, and Bourdain's MO, travel, to shine a critical light on the staggering amount of perfectly good food that is thrown away all over the world. 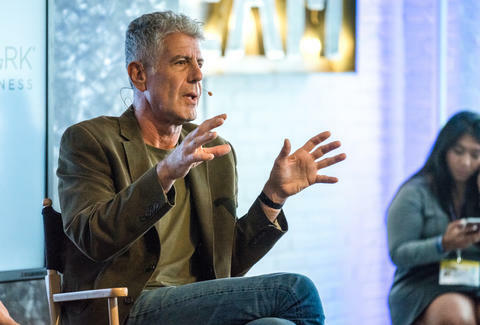 Additionally, Bourdain will be joined by several other culinary heavyweights such as renowned Italian chef Massimo Bottura, Danny Bowien of San Francisco's Mission Chinese Food, and Blue Hill's Dan Barber, among others, per the report. And while exposing the massive food waste problem is one thing, Rockefeller Foundation President Judith Rodin told Variety the film will also detail "how everyone can make changes to minimize what we throw away.” You know, so you can actually do something about the problem instead of just feel awful about it. The film, which is currently in production, is expected to hit the fancy film festival circuit in 2017, and hopefully, it'll land on Netflix sometime shortly thereafter. Tony Merevick is Cities News Editor at Thrillist and is looking forward to watching this. Send news tips to news@thrillist.com and follow him on Twitter @tonymerevick.